After a few days diving with Panorama doing day trips out of Hurghada, we realized we needed to get on a live aboard, otherwise we would leave not having seen the Red Sea that everybody raves about. Dee was in “let’s scour the internet” mode, as she uncovered a last-minute deal of the Emperor Superior. Less than 600 euros for the week and it was only half full. Wow. The down side we burnt 4 nights accommodation in the Marriott (at 30 bucks a night) and had to change our flights back a couple of days. But well worth it. We moved on board on Easter Friday night at 6pm and left heading North on Saturday morning after breakfast. 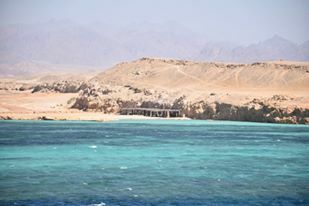 Our first dive was at Dolphin House on Sharb el Erg reef. Nice easy dive to make sure everyone was okey dokey. No dolphins unfortunately, but plenty of nice fish and a very nice nudibranch. This was the start of our routine of dive eat dive eat dive eat dive eat. Anna and Sergio (soon to be Mr. and Mrs Sergio) were our two dive masters and they were loads of fun. The second dive in the afternoon was at the Barge at Guval Island. Again a shallow dive at 14 and a bit metres, off the back of the boat, but the life on the wreck was exceptional. Huge morays and I mean huge. The biggest of them all was George at over 2m long. Georgette was huge as well and they had a few cousins as well. Nice looking smaller morays as well as well as Lion fish and a rather ugly Scorpion Fish. The night dive was at the same site and whilst the wreck was a little bit lacking in new interesting stuff, the reef system was teaming. 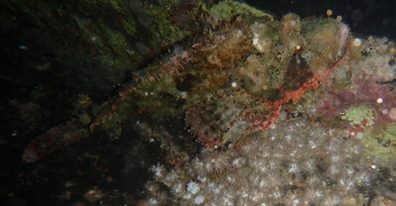 We managed to see a Crocodile Fish, some nice nudiobranches, crabs, starfish and the highlight of the night – a Spanish Dancer. Brilliant. Next morning we were up at 6am and off to ….Moller, for our first deep dive. We went off the Zodiac and down to 34m. Nice wreck but the vis wasn’t great. There was some good growth on the wreck and Sergio pointed out some interesting nudibranchs on the way up the mast. But the real wreck we had come to see was the Thistlegorm. Many say its in the best wreck on the planet and its certainly in my Top 3 (the other two being the Georges in Rabaul and the Japanese wreck in Gizo, Solomons). Our first dive on the Thistlegorm was around the sides, including a visit to one of the two locomotives that were on the seabed off to the side. Going back to the main wreck, we checked out where the bomb blew her to bits, with some shells and a tank upside down. We then checked out the propeller before finishing the dive on the deck. The second dive was very impressive. By then, there was a raging current and we made our way down clinging to the line that Sergio had tied to the bollards. This was a penetration dive and we had great fun visiting all the holds, with lots of BSA Motor Bikes, trucks, aircrafts wings and rifles. There were two levels so we had lots to explore. It was only a 24m dive but we ended up chewing air in the current. Unfortunately a lot of my pictures weren’t very good as I used my flash when I shouldn’t have, and the reflections of all the particles in the water destroyed the photos. So no amazing photos of motorcycles in the hold. The next dive was a night dive on the Thistlegorm, an excellent setting for a night dive. And it didn’t disappoint. Lots of colourful life and some interesting fish. Our dive boat was attached to the Thistlegorm via 3 lines, 2 on the front bollards and one on the propeller axle where the bomb broke it open. We ended up going down and up this one, which was a little difficult to find in the dark. But the water was clear and we were able to spot it via torchlight a fair distance off. After the dive Sergio had to go down and untie all these lines, reversing the procedure he did when we got there. Next day it was off to Ras Mohamed, a national park and another of the Famous Five. The first dive was at Shark Reef and the Jolanda. 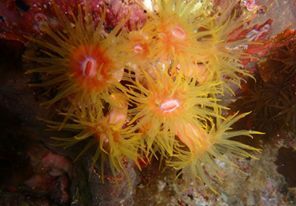 Ras Mohamed has got some of the best coral going and with the wonderful visibility, it makes for a great dive or four. There is no anchoring in Ras Mohamed so it’s a drop and drift dive with the zodiacs picking us up at the end. The Jolanda used to be a wreck but all that is left is some cargo, including believe it or not some toilets at about 12m. Interesting way to finish a dive. 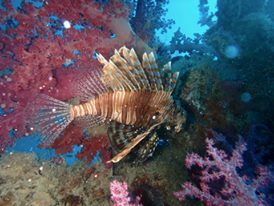 The next dive was a short motor along Ras Mahomed to Raz Zatar. This was one of the best wall dives I have done, beautiful clear water, nice coral and plenty of fish everywhere. The Gregorian Fans were massive and there were a few big pelagics floating by. After the dive, we were told that we couldn’t go to Brothers, because of the 25kts winds. The Famous 5 became the Famous 4. Instead we made our way up past Sharm El Sheikh to the Tiran straits to dive the 3 Reefs there. Thomas Reef was the first off the rack. There were boats everywhere, including quite a few day boats from Sharm. We got dropped off and picked up by the two zodiacs. The dive was good with lots of fish life including a couple of reef sharks and eagle rays, none of which I managed to see. The ride back to the mother ship was pretty chilly with the strong wind. The plus side is that there are a couple of rusting wrecks up on the reefs and we were able to visit one on the way back to the boat. Not having to go to Brothers meant we were able to do another night dive – or so we thought. However when we checked the current, we realized we would end up in Sharm if we went. So we took the night off and drank some wine. Next morning the wind was still up and it was cold getting into the wet suit. The boat had moved two reefs along to Jackson Reef, so at least we could start and end the dive on the boat rather than a cold and wet dingy ride. Another nice dive, the highlight being a turtle that swam by. As usual, we had breakfast after our first dive and then a little nap as we headed back to Raz Mohamed to a dive site called Anemone City. Very aptly name as it had the biggest anemones ever. There were whole schools of anemone fish living in a single anemone. I was still chewing air like I eat chocolate cake – too fast. So I ended up being first back into the zodiac. Dee was skipping a few dives so I got to dive with Sergio and he’d wave me good-bye as I inflated my Surface Buoy for the boatman to pick us up. The rest of the divers would come up 10 minutes after me. From here we moved around to the Dunraven wreck site. The Dunraven sank when the Captain went on a drinking binge following news that his first mate was sleeping with his wife – or so the story goes. Anyway it’s an interesting upside down 19th Century wreck that you can penetrate via a couple of holes in its side. Its not that big so the second half of the dive is up on the reef, where we saw a giant Napoleon fish and some more giant morays. For the night dive, we dove where we parked the boat around the corner from the Dunraven. Nice shallow night dive with some trevally who followed us looking to hunt in the light of our torches. 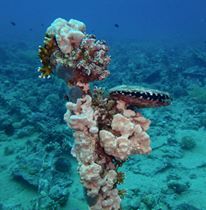 Nice lion fish, a moray that was out and about and some interesting terrain. After dinner, the Captain pointed South and we had a very rolly night heading down to the Salem Express, a car ferry wreck with a very tragic story. Over 1000 people died coming back from a Mecca pilgrimage when the Captain tried to take a shortcut on a stormy moonless night. It took us all night to get there in unexpected really windy conditions. And it didn’t let up in the morning when we hopped into the zodiacs to find the wreck. Normally they tie the boat to the wreck but the swell and the wind meant we had to tie up on a reef that was a way away. So we needed to use the Zodiacs to find the wreck. Or try to find the wreck, as without GPSes on the Zodiacs and with a big swell running, we spent a good 30 minutes getting sprayed with salt water searching to find it. In the end, Sergio had to return to the mother ship to get better directions. Our adventure on the high seas ended successfully and it was a relief to get into the water and out of the wind. The wreck was on its side in 30m of water, the top being at 10m. We swam around the outside of the boat, visiting the propeller and then through the loading doors that sprang open when the boat hit the reef. We only went in a little way as the Egyptians consider it to be a sacred place given the large loss of life. We got some nice pictures of the (unused) lifeboats, masts and port holes. Back at the boat we headed for Panorama Reef, which had some nice corals and fish life but nothing special to report. After lunch we moved again and dove on Middle Reef, which was an interesting shallow dive those potato coral bommies with nice swim throughs. The night dive was at the same spot and that was really good. We descended right on top of a large moray that was swimming around looking for a meal. We then got followed around by a couple of Trevally, who hunted in our torchlight. The lion fish also got in on the act, which is a bit disconcerting to find one right next to you as you try to take a photo of something else. We also came across a Slipper Lobster and a giant Napoléon Wrasse asleep (well trying to) in a hole in the reef. I don’t think he was that impressed with all these divers rolling up to his front door taking photos. Then to top it all off, we had some neat squid swim past at the end of the dive. The next morning, our last, we headed for Gifton Island for our 6.30am dive. Nice but nothing to write home about. The last dive (for us) was Gota Abu Ramada, which with the wind, had drawn a crowd. A couple of nice bommies rounded out the last of my 20 dives on the Emperor Superior, to add to the six I did with Panorama as day trips. Whilst I love diving and it was great to be in the water doing all those dives, I have got to say that the Red Sea didn’t really live up to its hype for me. I expected a lot more big fish and I didn’t sea a single shark or dolphin. This would have changed if we’d been able to dive Brothers of course, so that was a bit disappointing. On the plus side, the water on most of the dives was clear and the visibility was very good (but I’ve had similar or better elsewhere). The Thistlegorm was one of the best wrecks I’ve dove on so that a plus. The biggest plus was Anna and Sergio, a lovely Spanish couple who really looked after us and worked their buts off doing it. The food was good and the crew were great but the boat needed some TLC. The last dive of the day was the wreck that lay in Hurghada Harbour, a Russian made minesweeper that was sunk by the Israelis in the 60’s. We couldn’t go because we were flying the next day, so we had a wine or three whilst everyone else went down to 30m. The others soon caught up as we sat on the top deck and enjoyed the Sunshine with a group of Poms, a Hungarian, a South Korean, 3 Spanish and a couple of Swedes. The boat caters for 25 divers, we had a nice group of 12 on board, which made things very comfortable. We had our last dinner on board and headed off to the Marina for some more drinks. By 10pm I was done and dusted so off to bed I went. Dee and the rest carried on in my absence upstairs on the top deck as I slept like a baby. Next morning it was up at 7am for breakfast and then off to the airport – Egypt done and dusted! This entry was posted in Egypt and tagged diving, hurghada, Raz Mohamed, red sea, Thistlegorm by stull61. Bookmark the permalink.